What to Wear to Sunday's Cowboys/Giants Season Opener | Gina Miller's Blog - A working mom's blog about fitness, travel, handbags & beauty. Guys may scoff but any football-loving fashionistas know that looking the part while taking in the game is almost as important as how the team looks on the field. (I'm saying the Cowboys will go 10-6 this year, btw). Let's examine some designer looks that would work for Sunday night's game at AT&T Stadium. This is one venue, along with New York's MetLife, in which you can't overdress. You will see designer couture worthy of New York Fashion Week at both stadiums. This is a great, Hall of Fame suite level option from The Outnet. I think dark, skinny jeans are a perfect look for an indoor NFL game year-round. These Vanessa Bruno jeans are on sale for $60! 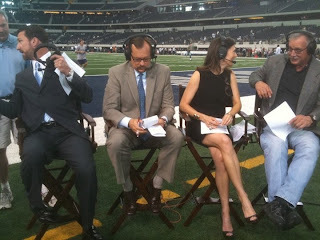 Pair the look with some great heels which always work for Cowboys games. I like the look of the Helmut Lang blazer. Note: you canNOT bring that big bag into the stadium. More on that later. To show you're a Cowboys fan, perhaps try a fun tank top underneath the blazer. I think official NFL shops could make these a bit more chic but this one isn't bad. These leather pants with an elegant, drape front top from Robert Rodriguez would totally work. Yes, you will SEE see leather at AT&T Stadium. This particular shirt might present an undergarment challenge, given it is open in the back. You can always grab a light wrap for the chilly suites. Thursday, we'll examine some sportier Sunday night looks for the Cowboys/Giants game. Remember, you cannot bring the big Birkin or Louis Vuitton Neverfull to the game. You may carry a small purse or a clutch that is 5.5" x 8.5" or smaller. A complete outline of the AT&T Stadium purse policy. Purse options that work within the guidelines of the Cowboys/AT&T Stadium purse policy. What do you think the Cowboys record will be this year? Post in the comments section.